Those of you who have been reading my blog for a while, hopefully know I'm not much of a "worksheet teacher". If there is a way to get my students to learn the material without a worksheet or textbook attached, I'm all over it. And even when a worksheet is necessary to consolidate the learning, I try to make sure it has a certain collaborative or reflective nature to it to take it a step further. The one area I've been trying to get my students more active in is in math. Again, I'm not too tied to worksheets or the textbook in math. My interactive math journals are just that - students INTERACTING with and reflecting on the material - not simply gluing a work sheet into a composition book and completing it with colored pencils (which I have seen way too much of lately ... but that's a post for another day). We do collaborative problem-solving like my Stick-It Responses and group and paired work with Building Better Responses, and work with manipulatives all the time, but all of these still have my students sitting through the activity. And that's just not good enough. I want them moving. I want them fully immersed in the concepts - mind AND bodies. I've done a little of this in the past - some work with place value and having the students wear a number and then build different numbers based on questions I've asked them. I've also done some in geometry where I've asked them to model certain concepts or shapes with their bodies. And each time I've done something like this, the students have had a blast. And they retained the information by the end of a unit. Problem was, I haven't done it enough. And then, just about a month ago, when I was working on a drama circle, I had a great idea to turn these kinds of math activities into Math Circles - just like the drama circles my students enjoy. I turned the questions I was already using into a more student-centered activity, where they need to collaborate with each other and follow along to complete the instructions on the cards. These math circles are just like the drama circles in which there are 40 cards - each one with a different direction or instruction. Similar to the "I have / Who has" format, students follow the instructions on the card to know when to perform their card. 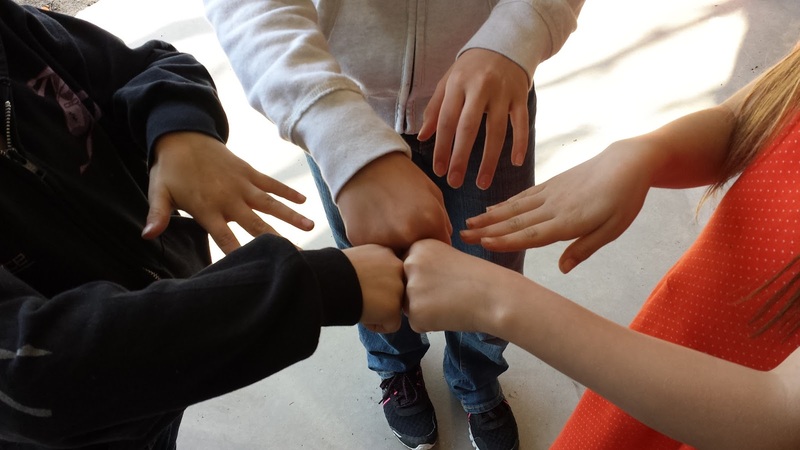 However, the math circles are more collaborative in that students must work with other students to perform the task. Because of this, I encourage a little more "turn and talk" at the beginning of the activity - when they first get the cards - this also helps alleviate a little of the anxiety for students who are unsure of how to carry out the task they have. Also, because the cards vary in difficulty, I can choose which students get which cards when I hand out the cards, so there's differentiation built in, too. 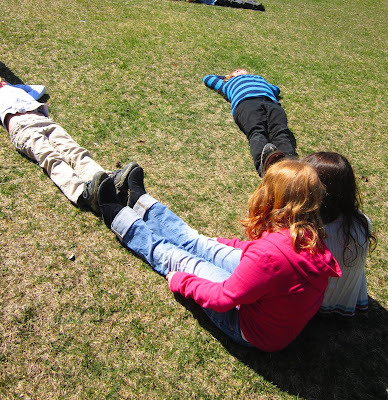 Students modelling an octagon with their feet. 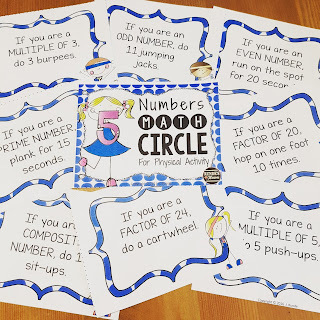 My newest Math Circle is one I've done for years as a warm-up before gym class, or as quick brain breaks in the classroom - Numbers Math Circle for Physical Activity. It follows a slightly different format, as for this one, the teacher has all the cards. Number off your students starting at one (I just tell my students their number, but I have also included number cards in the resource in case you think your students may need that physical reminder) and then start reading off the cards. For example, "If you are a prime number, do 10 jumping jacks". All students whose numbers are prime will stand up and complete 10 jumping jacks. It's a great way to integrate a little math review into your phys ed classes, or a little physical activity into your math classes ... and my students LOVE it! 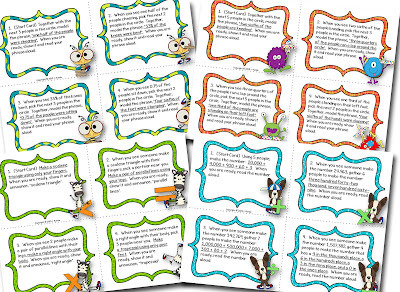 There are 40 different instruction cards included in the resource, but you can pick and choose any number to complete. If there are any other circles you would like to see, please leave a comment below. I'm currently working on a few more, but I could always use some great ideas. Also, if you have another way to get your students up and moving in math class, I'd LOVE for you to share your ideas below. Would absolutely love these geared more towards third grade standards-brilliant! I also would love these aligned to the third grade standards. My kids would love doing these circle activities. I am going to pass this along to some 4th grade pals. Love this idea!! Quick question: How many kids are in a circle? Whole class? Small groups with kids having multiple cards? We are all about anything that gets the kids moving. Scoot is extremely popular with our kiddos. We also play Brain Bounce, which is like a quiz bowl type game. I love how you have the kids get their bodies involved with this though. Great for those kinesthetic learners! 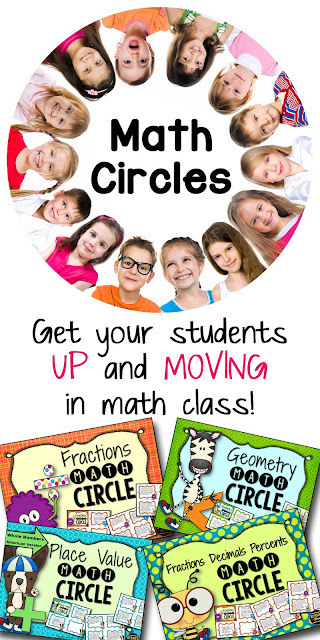 Are these (Math Circles) available in a bundle yet? I would love to get them as a bundle if possible on your TPT.